uuid : d09c3b3c-5ce7-4265-b0aa-40902c8b1fb8 templates_id: 119557 templates_uuid: "97fe7bd5-b8a7-439b-849a-f2a17f0baf9d" title: "Redundancy Consultation Letter - Arrange a Redundancy Consultation" display_name: "Redundancy consultation letter" meta_keywords: "Letter consulting employees about redundancies" description: "
Inform employees of the date and time of a meeting to discuss potential redundancies with this redundancy consultation letter. Although it is not always necessary to hold a physical meeting to discuss redundancy with employees, holding a redundancy consultation meeting shows a continued effort to keep employees informed of the situation and allows employers and employees to discuss the proposed redundancy in more detail. 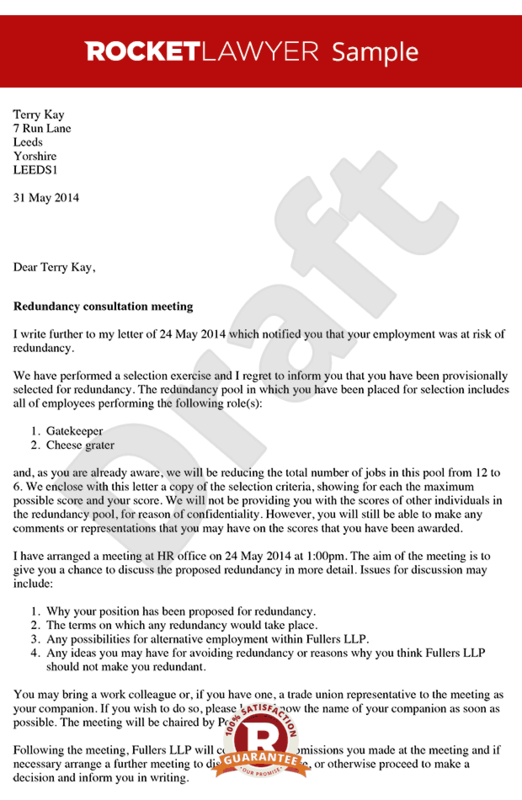 What is a redundancy consultation letter? Why do I need a redundancy consultation letter? Which issues should be discussed at the consultation meeting? Can the employee be accompanied at the consultation meeting? What\302\222s the next step after sending a redundancy consultation letter? \r\n" created_timestamp: "2018-10-08 04:36:55.0" modified_timestamp: "2018-10-08 04:36:55.0" active: true created_by: 236 modified_by: 236 dcm_id: 314 url_slug: "Redundancy-consultation-letter" meta_description: "Create an invitation to a redundancy consultation meeting with step-by-step guidance from Rocket Lawyer. Arrange a meeting to discuss redundancy with employees." time_to_complete: "15 minutes"
A redundancy consultation letter is a formal letter inviting an employee to a consultation meeting where potential redundancy will be discussed. It outlines the reason for the proposed redundancy and sets out the details of the consultation meeting. Sending a redundancy consultation letter to all potentially affected staff is an essential step of the redundancy process. It ensures staff are aware of the situation and gives them a chance to discuss their selection for redundancy during a formal meeting. A one-to-one consultation provides the opportunity to explore alternative options. It reduces the likelihood of misunderstandings and leads to better decision-making. Failure to consult employees may lead to unfair dismissal claims being brought to an employment tribunal. The chairperson conducting the meeting for the employer should detail the reason for the proposed redundancy as well as the basis for selection (if relevant). Employees should be able to discuss alternative ways of tackling the problem or, if redundancy is inevitable, ways of minimising hardship. Yes - employees can be accompanied at the meeting by a work colleague or trade union representative. Whats the next step after sending a redundancy consultation letter? Following the consultation meeting, managers should be able to decide whether staff should be made redundant or not. If redundancy appears to be the only way forward, the affected staff must be informed in writing with a dismissal for redundancy letter. More than just a Redundancy consultation letter template, our step-by-step interview and guidance makes it easy to create your document. Easily create online, download, print and sign your free Redundancy consultation letter in minutes. This document is also sometimes called: Letter consulting employees about redundancies.